Philipp K. Janert provides consulting services for data analysis and mathematical modeling, drawing on his previous careers as physicist and software engineer. He is the author of the best-selling Data Analysis with Open Source Tools (O'Reilly), as well as Gnuplot in Action: Understanding Data with Graphs (Manning Publications). 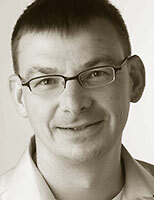 He has written for the O'Reilly Network, IBM developerWorks, and IEEE Software. He holds a Ph.D. in theoretical physics from the University of Washington. Visit his company website at www.principal-value.com. "I love this book a lot." "This book is perfect for hands-on readers, wanting to achieve specific goals without getting entangled in formal definitions by getting right to the point. Here is an analogy: a Common Kite is depicted on the front cover of the book and as the bird waiting for its prey, youll be able to analyse the situation, understand it and take a clear decision after this read." "This book offers a deep approach to real world tasks. There is much more text than code...It is hard to fault this book except perhaps that at nearly 500 pages, it is too short! " "Data analysis using open source tools is a straightforward, well explained and practical book which does not give just a laundry list of techniques but also useful pointers in how to use them intelligently. The book...is strongly recommended." "Data Ana­lysis with Open Source Tools by Phil­ipp K Jan­ert is a simply superb, solid and exhaust­ive syn­thesis of instruc­tion, work­shops and hands-on exer­cises designed for those ser­i­ous about con­duct­ing pro­fes­sional data ana­lysis. This is not a light­weight under­tak­ing...All in all, this is a very good book. It actu­ally does more than it prom­ises and deliv­ers a com­pre­hens­ive and effect­ive course in data ana­lysis with superb hands-on exer­cises to drive home the learning."